Railway and railroad officials narrowly avoided a major catastrophe on the train line between Oslo and Bergen, after fire broke out in a snow shelter along the tracks and eventually engulfed an entire train of eight carriages. Questions were flying over how the near-tragedy could have occurred, and a state investigation was launched immediately. Details of the drama on Thursday continued to emerge, following an initial period of poor communication caused by the fire destroying local telecoms cables. The fire started in an isolated area of the Oslo-Bergen line at Hallingskeid, in the mountains between Geilo and Voss, an area where there are no roads. — Fire broke out in a 200-meter-long tunnel-like shelter meant to keep snow off the tracks and keep service on the line going during the winter. The shelter encompasses the Hallingskeid station, normally used by skiers, owners of remote mountain cabins in the area, hikers and cyclists using the popular Rallarvegen dirt road that leads from the mountains down to the Sognefjord. — The cause of the fire was unknown but much of the structure was ablaze when one of state railway NSB’s new “Signature” trains approached, on its way from Bergen to Oslo. On board were 257 passengers and crew, including a 10th-grade school class from Voss, reported Bergens Tidende’s website bt.no. — The train entered the structure (called a snøoverbygget in Norwegian) and then its engineer couldn’t manage to reverse out of it again, after discovering the fire. The train was evacuated and passengers, according to newspaper Aftenposten, initially found shelter at a nearby, unstaffed cabin operated by the Norwegian mountain trekking association DNT. It was unclear why the train’s crew weren’t warned of the blaze in the structure and didn’t stop before entering it. — The entire train set was eventually engulfed with flames and destroyed, along with much of the belongings left behind by fleeing passengers. There was no loss of life, however, and no one was injured. — The fire also damaged a key fiber optics line for Telenor in the remote area, hindering telecommunications. The lack of roads in the area also created delays, with firefighters and equipment needing to be brought to the scene by helicopter and on trains from both directions. Passengers were eventually taken back to Voss, east of the accident scene, by another train that came from Voss to pick them up and then reversed for the return trip. Passengers interviewed by Norwegian Broadcasting (NRK) and other media were shaken but most said the evacuation went well. Several said they were scared but agreed the entire incident could have had far worse consequences than just material loss. Those losses, however, are expected to cost already-beleaguered NSB and state railroad Jernbaneverket tens of millions of kroner given the destruction of a train and needed repairs to the tracks, equipment and reconstruction the structure over the tracks. “It will take time to built it back up again,” said Harry Korslund of Jernbaneverket. “Fortunately we’re right at the beginning of the summer and not the winter,” he added, so Jernbaneverket can get the work done before it starts snowing again. It’s unfortunate, however, that the popular Bergen-Oslo line known as Bergensbanen was forced to close at the height of the summer tourist season. Many trains are sold out at this time of year and railway officials couldn’t say when the line could re-open. Bus service was being offered for the stretch between Geilo and Voss, otherwise one of the most scenic portions of the train ride. Hallingskeid is also the stop just before Myrdal, where many tourists transfer to the scenic train line known as Flåmsbanen, which winds down to the Sognefjord. 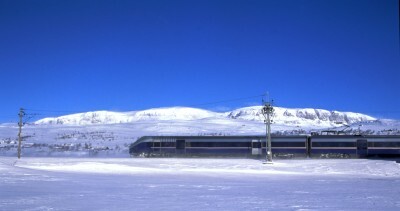 That may disrupt tours, at least during the next few days, because service was halted between Myrdal and Finse and there were no connections from the east, the Oslo side of the line. Some trains from Bergen, though, were going to Myrdal and NSB was making efforts to reopen service as soon as possible, maybe within a few days. Trains were also still operating on Friday from Oslo to the mountain destinations of Geilo, Ustaoset, Haugastøl and Finse. Passengers can get updated information via NSB’s website (external link, in Norwegian) or by calling NSB’s customer service center at 815 00 888.